．Special designed ear for both front and rear. The high quality product design is selected heavy duty steel hardware material to make EGK-1500 construction and top cover. There are varnishing and galvanizing from rusty for metal surface protect. Using open frame switching power to provide the +5V/+12V voltage for KVM switch with LCD inverter. The adapter support auto range AC input (90 ~ 260 AC Voltage). 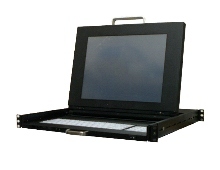 LG XGA 17” TFT panel is LVDS type display, It’s support 1280 x 1024 pixel resolution, the color depth is 8-bit 64M colors. Supports high density pixel pitch is 0.264 x 0.264 mm to display per dot. Used quarter lamps for panel glass backlight to show word on screen, also providing white light of luminance in 250 cd/m2( (Typical). Normally, the Lamp operating frequency is from 45 KHz to 80 KHz. The Lamp life time minimum 50000 hours. The power consumption just needed 10.18 Watt. It’s no heat problem. The most thickness design and lose weight about 1000g. Panel environment absolution maximum rating to say operating temperature 0 degree C to 50 degree C and storage temperature -20 degree C to 60 degree C, also to say operating Ambinet humidity 10% to 90% and storage humidity 10% to 90%. The Keyboard as back lighted keys to help operator in low light environnement or user who need more lights. It has included cell phone ring indicator when your mobile phone has a ring in. Use mechanical key modules from ML series with high-precision key action. The high reliability characters about 134000 hours MTBF operating life of individual.